This ELH Challenge required the creation of an interaction that introduces an instructional design principle, model, researcher, or theorist. 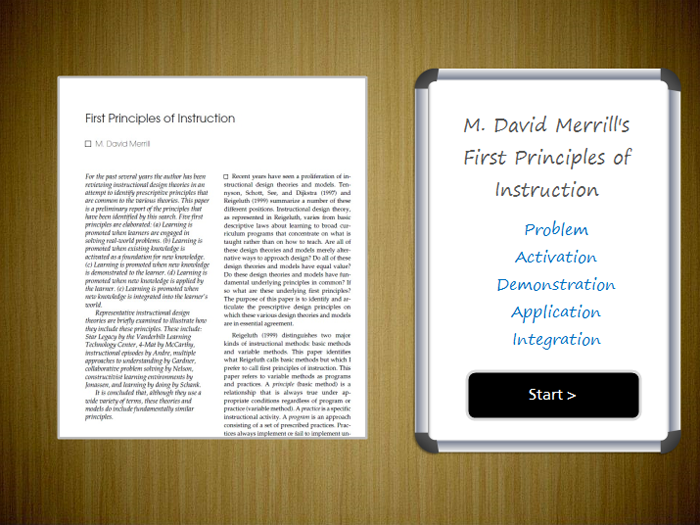 For this challenge I chose M. David Merrill’s First principles of instruction. Simon says “follow the first principles of instruction”. The layout of the principles — with a central hub and four surrounding components — provided me with an interaction idea. The layout is similar to an electronic game called Simon Says. The interaction is a quick-fire quiz created in Articulate Storyline using the Convert to Freeform tool. Five statements are provided and the learner has ten seconds to select a principle that the statement supports. When the learner selects a principle, they are presented with the relevant custom layer for: correct, incorrect or out of time. Simon says “Click the instructional designlearning activity below”. Launch the first principles of instruction activity.